Most of us are aware of the benefits of Aloevera. In case any of our readers are not aware of it, let me sum up some of the well known benefits of this magical gel. 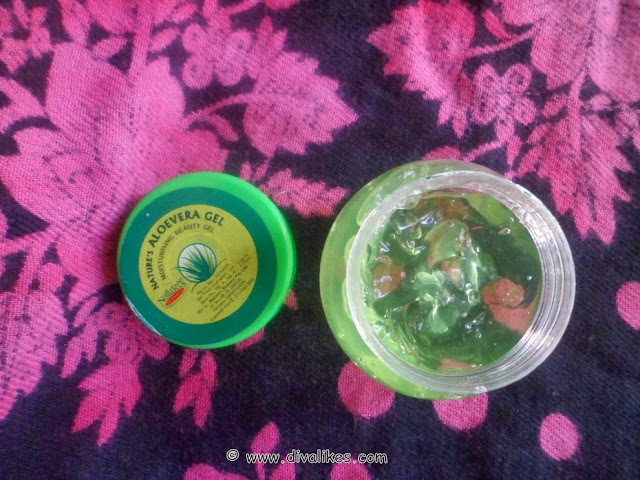 1) Aloevera helps in treating sunburns. 2) It moisturizes the skin. 3) It contains hormones like Auxin and Gibberellin which helps in wound healing and can cure acne. 4) It relieves skin rashes. 5) It can be used as an aftershave for men. Aloevera plants are abundant in nature. They can be easily grown in a pot in our garden. But peeling and scooping out the gel can be a messy and cumbersome job. 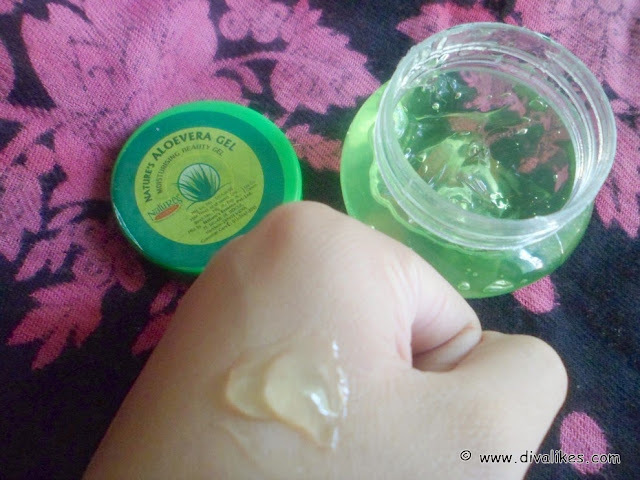 These days ready to use Aloevera gels are available in the market which make our task easy. 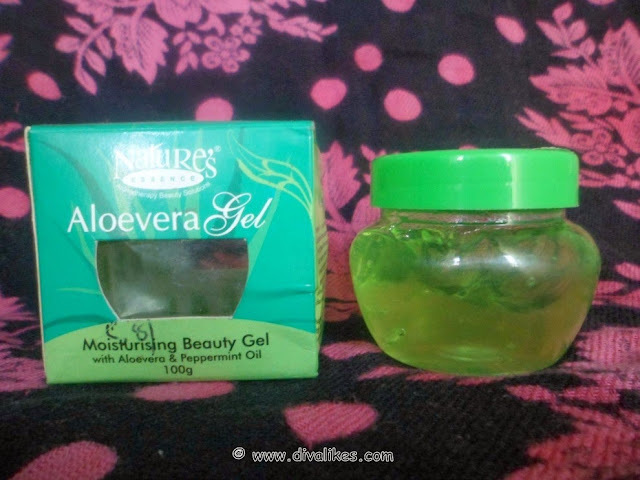 One such gel I came across is Nature's Essence Aloevera Gel which I am going to review today. 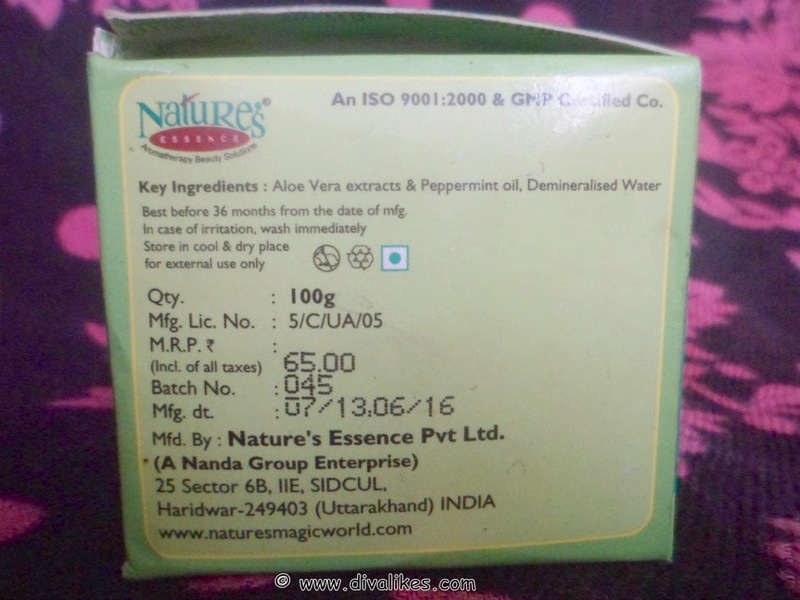 Nature's Essence is a well known brand for its facial kits. When I saw this gel in a local shop, I couldn't resist myself from buying it. It was also pocket friendly and I thought I should give it a try. Aloe Vera is a world renowned plant for its cosmetics and medicinal miracle properties. Nature's Essence Aloe Vera uses the goodness of this miracle plant from its natural source along with modern manufacturing processes to offer you a treatment moisturizing gel ideal for softening the skin, protecting it from sun damage and acting as a guard and immunizing agent against skin ailments like dry skin, acne & itchy skin conditions. The gel is an ideal solution for gifting you soft, glowing and pampered skin. Aloe Vera extracts & Peppermint oil, Demineralised Water. Apply the gel after cleansing your face and massage the gel softly into the skin for softening and protecting it against environmental pollutants. Ideal to be used every day. The gel comes in a cute little plastic tub with an aluminum cover over it. The plastic is very sturdy and won't break even if you drop it accidently. The cap is very tight and prevents product spillage and hence it is travel friendly. But I feel that the packaging is unhygienic as you have to dig your finger every time you need the gel. I kept a separate little plastic spoon for taking out the gel. The color of the gel looks green in the tub but actually it is transparent once you take it out. The consistency is jelly like. I just love the smell. The fragrance is very strong and refreshing but it gradually fades away. This gel feels really cool on application and gets absorbed quickly giving soft shiny appearance to the face. I don't know why it is named as beauty gel. Atleast I cannot relate to it. This gel can be applied anytime of the day but I prefer using it at night before going to bed. If I find my moisturizer to be oily, then I just mix a blob of this gel with it and then apply it. In this way my moisturizer feels less oily and my face also looks dewy. I love my skin to look dewy rather than totally matte. It gives a cute innocent appeal. Since this product is super affordable, you can try it as it won't pinch our pocket much. I think given its super affordable price tag anyone can give it a try as it imparts an instant glow to your face. Also it has a very refreshing smell. But I have my apprehensions on its incomplete ingredients list and tub packaging. Really Lavanya its very frustratng whn the products gets into your nails uhhh...anywys thnx dear.. I have used the Patanjali one also Naomi and it is good..
Thnk u so mch Garima.. Yes Subha they are unhygienic..They should come in tubes..
Thnk u Vipra..Yeah its worth a try..